Why is it so hot in school? Why is it 88 degrees in my school? When asked when the AC will be turned on, the answer is “we don’t know”. How are students supposed to concentrate and prepare for testing in two weeks when they are hot and sweaty? I would like to know, is the AC on at VanHoose? This anonymous* letter was submitted from a parent via our open letter form. I found out this morning that my son’s bus has been dropping him and his schoolmates off early and then driving off without waiting for them to get into the school. It is a well known policy that students don’t come in until 8:40am. There is no adult supervision until then. This driver has repeatedly left students in a dangerous situation. The school is angry, the parents are angry, the children are scared and JCPS is simply “looking in to it.” Leaving students unattended is just unconscionable. 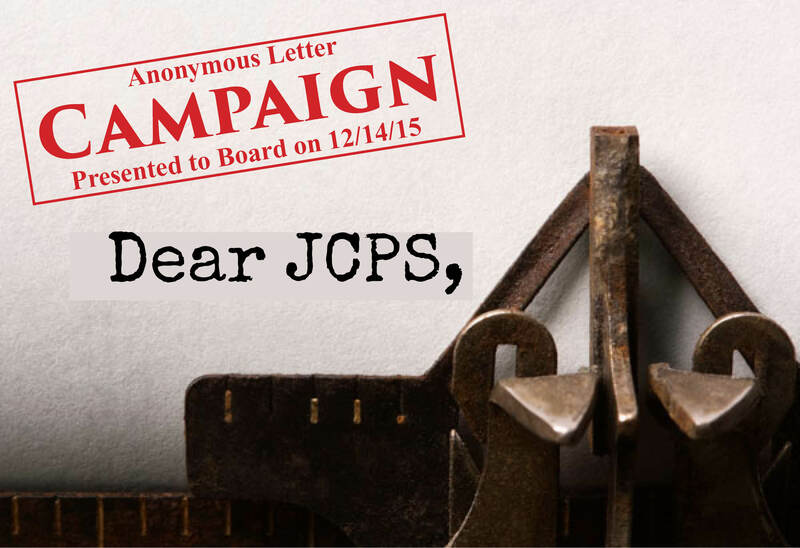 * As with all anonymous contributions, the identity is known by Dear JCPS administrators, but not shared publicly. 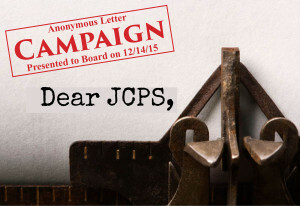 Should a board member wish to be put in touch with the person submitting the anonymous letter, arrangements can be made by contacting your Dear JCPS liaison. Thank you. I am a teacher. I love my job. I love what I do. I love the school I work at. With that said, I believe there are so many issues right now plaguing our system and schools that there just simply isn’t a 1 single answer to fix it. It didn’t get this way overnight…thus it can’t be fixed overnight. If we look at everything through the realm of data, then surely, if we truly love kids, 1 kid being bullied is too many. That data should be zero. 1 kid being bullied can lead to 1 kid committing suicide, or 1 kid harming 10, 20 or more other kids and adults by exacting revenge in a more violent rage. Kids misbehaving has never changed. How they are dealt with has. Both at home and at school. We have spent so many years holding schools, teachers and districts accountable, thousands of hours analyzing and crunching data and spending millions on the newest and latest trendy idea from a consultant or expert that somewhere along the lines we forgot to hold children and parents accountable as well. Yes, the home dynamic has changed. Yes many kids are poor and hungry. But we can not hide behind those excuses because doing the right thing has nothing to do with being poor or hungry. There are so many issues and I am not an expert to offer valuable solutions. I’m just a teacher. On the front lines. To make the changes that are necessary in our school district means leaders making tough, hard and often unpopular decisions and choices. Leaders are afraid to admit there are problems because that means admitting they made mistakes. There is an old saying “perception is reality” and if our leaders believe there is a perception problem…then I and the rest of the world should be able to conclude that YES…there is a problem. To keep this short, I offer one other change….return vocational schools. At the end of 8th grade…maybe even 9th, require all students to take a test and based on that test…determine if the kid can continue with a regular diploma in preparation for college; or attend high school with a designated career/vocational training path so they still get basic courses until sophomore year and then they begin reporting to vocational school for training for a job. They may not get a diploma but they have a “technical degree” which allows them to be hired full time after high school. To me…THAT’S being career ready…not what is in place now. Again..these are not easy answers. They are ideas that will be shunned by those in leadership positions. Heck, they may not even be the right ideas. And by no means are they the ONLY ideas. But the bottom line is this…whatever is done is going to require tough decisions, by tough leaders who are not afraid to take a stand, to do what’s right, and do what’s different. Then, and only then…will the reality and perception of reality truly change. * Identifying information has been removed from these letters. However, their source is not anonymous to Dear JCPS. JCPS Board members have been provided with a Dear JCPS liaison and are encouraged to contact us to validate, verify, and follow-up on any of the concerns or suggestions in these letters. I am a JCPS student. I am here tonight to share with you a message from DearJCPS members. Teacher voice and choice is critical to their morale and effectiveness as educators. Their effectiveness as educators directly impacts student learning. Recently, there has been a high number of substitutes at my school. These substitutes aren’t just for one day or even one week. Most of them are there for three months or more. For example, last week in my math class I was able to finally have a permanent teacher although it was already the middle of the second trimester. Between the time that school first started and last week, I have had not even a proper substitute but a volunteer as a teacher. Now, you may ask, “how does this affect my learning?” Well, when the new teacher came in he did not know where we left off at so he jumped into something that my classmates and I have never heard of before. To put it all into perspective for you, it would be like jumping into long division when you never learned basic division in the first place. This has made it extremely hard for my fellow classmates and I to be able to get to the point where the state wants us to be. There is so much talk about ‘closing the gap’ but how shall we do that if we aren’t even able to have the proper teaching that we need and deserve? When teachers have voice and choice, they have the power to make the best decision for teaching the students in their classes. Teachers morale will increase and they will stay in positions and hopefully other students will not have to experience what I have this year. We need our teachers to stay in the classroom. We cannot learn everything we need to learn without them. We need JCPS to empower our teachers and allow them to focus on teaching us; not on paperwork that takes time away from our learning. I hope that you take the time to read the letters that address teacher voice and choice. Please listen to the experiences and the suggestions, because our futures literally depend on it. Thank you. I agree JCPS is not offering African American at-risk youth what they need to succeed. I’m not sure if the district is not equipped, or doesn’t care enough to do the research and spend the funds to put the correct programs in place. I am an ECE teacher in EBD self-contained classroom. I have never had any students that are not African American and my students are always disproportionately male. My heart is teaching African American boys, but I hate, hate, hate that many of them are labeled at an early age as having a behavior disorder. I see so much promise and I see a desire for acceptance and success in their eyes. I am also a teacher that believes in starting everyday anew and not holding grudges or bringing up past behavior as a way to shame students. I have the same conversation every year the first day of school. As we get to know each other and talk about a self-contained class, I have them come up with places in society that are self-contained. Almost all of them list prison/jail as #1 and state (sometimes yell) that it’s not where they want to be. Then from that point, we make goals on how to get out of a self-contained class, be reintegrated in general education classrooms, and stay as far away from that school to prison pipeline as possible. Here’s the even more amazing thing! All my students have from average to above average intelligence, but most have not had anyone focus on their intellectual talents. There has been too much focus on the negative. I would love to see JCPS begin providing more supports for my students and ALL African American at-risk students. One of the first things we are taught in teacher education classes is that when giving feedback, we should sandwich positive feedback around the constructive criticism. You are going to read many letters telling you about problems that stakeholders are seeing, but to hopefully help you to be a bit more open minded to the criticism, I would like to start by giving you a bun for your “feedback sandwich”. I am a teacher here in the district, and I love my job. I feel that I am one of the “lucky ones”, because I don’t face a lot of the struggles that many of my colleagues face at other schools. As much as I would like to remain truly anonymous, I cannot accurately share my thoughts without identifying where I work. You see, I am proud to teach at the only public all-girls middle school in the state, Olmsted Academy South. Amazing things are happening there, but I’m not sure how much of the public—and how many of you, for that matter, realize that we are no longer the troubled former school that was located in our building. So this is also my moment to brag, because anyone who takes the time to walk through our doors—including our own Dr. Hargens—realizes almost instantly that the atmosphere is so different from a typical Title I school. What makes our school amazing to me? I could go on and on, but I will try to remain concise to honor your time. 1) Our girls are separated from middle school boys. I have taught in a co-ed school prior to OAS, and many of my colleagues worked in our building before the “experiment” that created the Olmsteds. The population at my school is around 90% free and reduced lunch. Many of these young ladies do not have sufficient guidance, attention, and love at home—not because their parent(s)/guardian(s) don’t love them or don’t try, but because so many of these girls live in single parent homes with absent fathers, where mothers are forced to work multiple jobs or late shifts. A substantial percentage of them live with foster parents or extended family members, or are even adopted. I’ve lost track of how many have lost at least one parent to drug overdoses or jail. Yet the girls of OAS have the amazing opportunity to focus on their education without being distracted by which boy thinks they are pretty, or whether their best friend is flirting with their boyfriend, or most importantly whether a boy won’t like them if they take a risk in the classroom. At OAS, we get to inspire young women and empower them to see their potential. When I tell people I work in an all-girls middle school, their eyes open wide and they say, “Oh, there must be a lot of drama.” Actually, we have much less than a typical middle school. When you remove boys from the equation, middle school girls are pretty awesome. I want you to know how wonderful the all-girl environment is for our girls because many of us are concerned that our time is limited because politics and budget issues will someday take away our little slice of heaven. It is my sincere hope that OAS will remain an all-girls school. I believe it is necessary for these girls to receive an education that focused on them and their specific needs, and shows them their potential to be leaders in the community. 2) We have small(er) class sizes. If you want to, you can find research to support just about anything, whether the research is sound or not. But it is not logical to think that a typical (read: non-superhero) teacher with five classes of 32 students (160 total) can be as effective as a teacher with five classes of 20 students (100 students total). Consider the amount of time a teacher with 160 student spends grading and giving feedback: at 3 minutes per assignment, that is 8 hours total—compared to 5 hours for 100 students. Do you know what we do at OAS with those extra three hours? Planning innovative lessons, attending professional development, developing intervention plans for struggling students, tracking data…I could go on, but I think you get the picture. Yes, occasionally a teacher may come along who is able to be just as effective with 160 students versus 100, if she devotes nearly every waking minute to her job. But you need a solution that works for the Accomplished teacher, not just the few Exemplary ones. At OAS, our class sizes allow us to build relationships; be more effective at keeping students on task; and give valuable, immediate feedback. 3) Time is built in to our schedule for teams and departments to collaborate in PLCs every day and to participate in EPD weekly. I cannot imagine how I would do my job as well if I did not have these opportunities to work closely with my colleagues to plan, analyze data, calibrate grading, and strategize on interventions for struggling students—and also have time to create lessons, grade, and make copies during my planning. It is mind blowing to imagine having to spend my planning or after school time collaborating, and to have 60-80 more students, yet this is the situation at other schools. 4) We have support from our administrators. I know from experience that this is not the case everywhere, but at OAS, teachers are empowered to handle Level 1 behaviors on team. Through PBIS, which our administration has bought in to, we have been provided with strategies for not escalating Level 1 behaviors. Whenever possible, we are given support to prevent small things from becoming big things, like students not bringing pencils to class, which is no longer an issue. When we do have those students who are more challenging, we work together to come up with interventions, solutions for progressive discipline, and counseling as needed. If there comes a point that we do feel we need to notify an administrator or counselor of an issue or concern with a student, it is addressed in a reasonable timeframe with fair and appropriate consequences. 5) We have intervention supports that help us to prevent student behavior from escalating. I have worked at OAS for 4 years, and every year overall student behavior has gotten progressively better. I truly believe a huge factor in that has been our calm, assertive SRT Lead/Behavior Coach who is a great fit for our school. If we do have a student who is having a bad day and their behavior in the classroom escalates into a way that disrupts the learning, and the student is refusing to take a break in a Buddy Room, we can call the front desk and ask to radio the Behavior Coach, who will take the student for a walk and a cool-down, then bring her back to class. If there is conflict between two or more students that is disrupting the learning, our Behavior Coach will take the girls to the PAC room, settle the conflict, and send the student back to class. This has prevented so many small situations from turning into big ones, and the learning continues. 6) Teachers are respected as leaders and experts, and our input on decisions is welcome. If I have an idea, I feel comfortable suggesting it and that my idea will at least be considered. Many decisions at OAS over the past four years have been made based on our ideas, which has built a culture of ownership and investment among the staff. Staff members are recognized for their hard work on a regular basis and we feel appreciated for all that we do. As a staff, we genuinely like and respect each other as well as our administrators. Our relationships with our colleagues influence our students and how they treat each other; they see our collegial relationships and our rapport, and it sets an example for our girls. I could probably go on, but I know you have many more letters to read. The moral of my OAS story is this: OAS is not perfect; we have our share of struggles and challenges every day. Our girls have backgrounds and lives outside of school that are horrific for some of us to imagine, yet they come to school and smile, and do their best to be successful. We are proud of our progress and what we have been able to do for our girls; we want to keep building a school with a reputation these young ladies can be proud of, and most of all one that they deserve. We know that our KPREP scores could be better, but we are doing so much more for these girls than helping them do better on a standardized state test. Speak of the devil, the current state accountability system that puts schools in priority status based on percentile is ludicrous. It fosters competition among schools rather than collaboration. Ms. Hackbarth wants to talk about breeding mistrust? Perhaps we should talk about how much trust is lost when schools look at each other as an enemy to be defeated rather than as fellow soldiers on the same side of the front line. The system also guarantees that there will always be schools in priority status; there will always be schools that aren’t good enough, no matter how great they are. There will always be schools that are better or worse—which is an insane concept to me. The Supreme Court determined back in the 1960s that equitable education is a Constitutional right, yet this system is determined to ensure that our schools are not equal. Now for the meat of my sandwich. I know that the JCPS Board of Education does not have control over the state’s accountability system. Maybe someday it will change, but in the meantime, JCPS does have the power to be transparent with the public. The media tries to interpret test scores, without fully understanding what they mean or how the rating system works, and schools get labeled as good or bad. Add the test results to the stories about JCPS that seem to be appearing in the media daily, and the list of “bad” schools in JCPS is getting longer. Unfortunately, the opinions of the subjective, public jury affects the morale at those schools and makes the situation worse. But if you aren’t out there in the schools, seeing the cultures that lead to the incidents described in the media, how can you really understand? This is why you need to listen to those of us who are out there on the front lines. The time for denial has passed. The time for feigning ignorance is past. When you know better, you do better. Perhaps it is time for JCPS to change the narrative—and I don’t mean by lying or twisting the truth. Stop limiting what you’re willing to say to the public and what the public is allowed to say to you. When my kids get irritated that we are on them to improve, we tell them, “If I wasn’t on you, it would mean I didn’t care any more.” We are taking the time to write these letters because we care. The world would be a scary place if nobody who saw a problem was willing to do something about it. You have a chance, right now, to decide to partner with the stakeholders of your community and do something innovative and amazing. Instead of letting charter schools come in and take funding because parents are fed up, get ahead of them and start partnering with the people who are ready to work with you to come up with real solutions that benefit the entire community. Be grateful that you have parents who want to help! Don’t assume that they are clueless about what’s best for their kids; parents are the ones entrusting us with their children. It is your job to make sure we are doing right by these kids, and not just when it comes to bubbles in a booklet. Part of being a teacher means being willing to have colleagues, administrators, and even district personnel come into your classroom and give you feedback on how you can improve. As a new teacher, it is daunting to know someone is going to tell you what’s wrong with you, but if you can develop a growth mindset, it actually becomes exciting to have a fresh pair of eyes who can see the things you might miss and to give you suggestions on new things to try. JCPS needs a growth mindset! Can you imagine what the state, or even the entire country, might say about JCPS if it became a district that is excited that there are people who care enough to want to help, where parents are partners, welcomed to give feedback and be part of the solution? I have been debating about what to put in my letter to you, because there are so many things that need to be said. However, I would like to address the state of behavior at the middle school level, and the lack of consequences and administrator involvement. I have been a teacher in Achievement Area 5 for the past seven years. At my current school, I can honestly say that I feel unsafe. On a daily basis I am not only breaking up fights, but dealing with students screaming in my face because I have asked them to take off a non-dress code item, or simply asked them to follow along with the class on an assignment. In addition to the violence that I see not only between students, and between students and teachers, the language is absolutely atrocious. Before eight o’clock on any given day I have heard the F word at least 20 times. It happens so much that it is now culturally acceptable. Why is this continuing to happen? Glad you asked! This past summer, I came in to work on setting up my classroom. An assistant principal and I were talking about how they just got back from a meeting with the district. At this meeting, all assistant principals were told about new student discipline practices. They told me that representatives from the district told them that if a teacher is threatened by a student, to have the student apologize and go back to class. Not only are the teacher’s hands tied, but the administrators hands are also tied with what they are allowed to do. We are also constantly being told about suspension rates, and keeping our suspension rates down. If an assistant principal has a high suspension rate, they get a phone call from the district about keeping their rate down. What exactly happened to the phrase, “the punishment fits the crime?” We are doing a disservice to our children by not teaching them that when they behave a certain way; they will receive a certain consequence. In our school, we use the BIL system to report behavior, instead of paper referrals. Unless I walk up to an assistant principal and tell them that I wrote a BIL that I need them to look at, and do something with, nothing will happen to it. I have had BIL’s at a level 4 and 5 go completely unanswered. They are completely overwhelmed with the behavior, which makes the teachers also completely overwhelmed. Here is my challenge to all board members: get out in the schools! You know which schools in your achievement area are struggling. Show up unannounced and observe, talk to teachers, talk to students. Get a feel for what is actually going on in the school. When you tell the school you are coming, they will put on a dog and pony show. You won’t see the real problems that are happening. Then, and only then, will you be ready to help us find solutions. We all know that we desperately need the solutions. Please help! This letter was submitted via our open letter form. It does not necessarily reflect the views of Dear JCPS. Jefferson County Public Schools is in crisis. However, we have not reached the point of no return…YET. I come from teachers. My grandmother dedicated 30 years to our district, many of those years served in struggling schools. I myself am a ten-year veteran of JCPS, all of my years served in Title One schools. I went into education to help shape our next generation. I loved school. I loved my teachers. I learned Reading and Math and Science and was made to believe that I could be someone in this world. I wanted the same for all of the kids who would cross my path. I wanted to help them believe they could be better people, that they could be somebody. For those of us in classrooms, we have seen a change. Last year was tough. This year has been my most difficult year yet. I feel that my mission, my passion, is no longer relevant. My days have become more about survival. Being able to teach or make a difference is a bonus. Here are some things that those who work in my building, who work with OUR students, need for you to know. We have had four teachers resign since August. One of them, a veteran teacher of more than 20 years, was attacked by a student and injured. She decided that she had had enough after our administrator ridiculed her and called her a “big baby” in front of the office staff. Another resigned two weeks ago citing “hazardous working conditions.” This leaves three classrooms in our building with a rotating cast of subs, IF there are subs available. We are in crisis. Many of our students make our learning environments unsafe. Within the first month of school, I had a first grader who attempted to stab another student in the head with a pencil. He would have succeeded had I not intervened. We are in crisis. One of our staff members is currently engaged in a lawsuit and has an active protective order against a parent who threatened to gun her down. This parent has a criminal record involving instances of gun violence. We are in crisis. We have had more suspensions in our building this year than we have ever had. All of these suspensions have been hard suspensions for violence against adults and other children. We are in crisis. We try hard to follow a progressive discipline plan, but it often takes an act of congress to get the help that WE need in order to help our students. We are following the correct procedures and doing things the right way, but our kids aren’t getting the help that they need. One kid, three suspensions, two of which have been pushing and threatening to hurt teachers. However, he is still in a classroom. We have followed the pathways to success, implemented each step, yet he has not gotten the help that he needs. We are in crisis. The best of us are cursed at, disrespected, and made to feel that we have no authority in our own classrooms. This disrespect comes from students, parents, and sometimes administrators and assistant superintendents. We are not supported in our efforts to stand up for ourselves. We are asked if we have used all of the “tools in our toolboxes.” We are in crisis. Change the student code of conduct. Take the administrative ambiguity out of consequences. Some things in the code of conduct need to be black and white. It makes teachers feel more supported to know that there is ONE pathway towards a consequence for a particular action. For example, if a student demonstrates violence towards an adult, it should be an automatic suspension to the board of education, with a parent, before they are able to re-enter the classroom. Stop telling us that we are suspending too many black boys. Students who are committing acts of violence and disrespect, no matter their race or gender, need to be suspended. Allow us to appropriately discipline students, even if they fall within a minority class! The real world has consequences. It is important that we teach ALL students that there are consequences for their actions. Allow elementary school students to be suspended to the board of education for certain actions. If they have to appear before you for breaking the rules, then maybe you will have a better idea of what we are constantly dealing with in our classrooms. Address the fact that certain schools end up receiving many of the behavior problems other schools don’t want to deal with. Kids are shuffled around. Just because your school has parents who would file lawsuits or press charges against violent and disruptive students doesn’t mean that they should become another school’s problem. Bring back small behavior classrooms within each building. Our most severe kids need somewhere to go where they aren’t interfering with the learning of regular kids. Pour your resources into those classrooms. Hire trained staff and implement multiple support systems to address the emotional, physical and educational needs of these students. Construct progressive plans of re-entry so that students can be integrated back into comprehensive classrooms as they make progress. Make parents ACCOUNTABLE! Require parents to meet with teachers and administrators before re-entering school. Children should not be allowed to come back to school until the parent shows up and signs a plan of action to prevent future suspensions. Let’s be creative with our suspensions. Maybe suspended kids shouldn’t get the day off. Require them to do mandatory service work. Provide a bus leaving from VanHoose. Put them to work reading to the elderly, cleaning cages at Louisville Metro Animal Services, etc. Be creative with the use of restorative practices. Get creative with addressing our students’ social needs. If children are failing to thrive in their current environments, why not find ways to remove them from those environments? We as a school district needs to take the lead on some of these societal problems. Bring back vocational programs in our middle and high schools. It is unrealistic to believe that all of the children who walk through our doors will be going to college. Not every student will enjoy or be good at the core subject areas and disinterest leads to behavior problems. Teach them to use their hands. Teach them a skill that could lead to a job. Allow them to become passionate about something other than Reading and Math. Stop making it so difficult for students to qualify for special education services. Children who struggle because of a learning issue often feel so unsuccessful that they act out in school. If you streamlined the process for getting the necessary kids qualified, they may begin to feel like they CAN achieve success in school. You’ve made it so difficult for teachers to refer a child for services that many teachers simply give up and pass kids off to the next grade level without the help that they need. The long and short of it is that if things stay the way they are, if our classrooms and schools continue to become places of violence and mere survival instead of places of learning and thinking, you will lose students. We will lose our best and brightest to the private or charter sector. You will lose parents. They will invest both their human and capital resources elsewhere. Most importantly, you will lose teachers. There is only so much abuse that a person can take, no matter how worthy the cause. You have the opportunity to fix this. It will not be an easy job. However, if you are willing to take our suggestions and admit that you are working on these issues, we will stand with you and do our part to make sure that EVERY school and EVERY student has the chance to succeed. *Identifying information has been removed from these letters. However, their source is not anonymous to Dear JCPS. JCPS Board members have been provided with a Dear JCPS liaison and are encouraged to contact us to validate, verify, and follow-up on any of the concerns or suggestions in these letters. Here is an adapted / conglomerated set of conversations I have had with some board members around the subject of magnet programs. The board already has heard from me on these issues in multiple ways. All of this was, for the record, well received by everyone I communicated with – David Jones, Steph Horne, Dr Hargens, and Diane Porter. Thanks for your enthusiasm and commitment to change. The problem with our high-performing magnets like the MST, G and T, and HSU, are that there are NOT ENOUGH SEATS. Every child who can do the work should be allowed to try the next challenge. ( “every child who can do the work” not “every child with a certain test score.” Using single test scores as admission thresholds to high-performing programs makes all the work the kids and teachers do all year seem unimportant.) The next challenge, being a college-bound education with consistent challenge, should be available to every child in the district. Today, it is not. – Access to extracurricular activities that allow pursuit of interests such as specialized arts and sports. Why is it that there are not enough spots in the system to accommodate the needs of high-performing students, and of students who want to try to challenge themselves? I think there are enough stellar teachers and enough kids who would do Algebra in 8th grade if put on the path to do so, that we could have “optional and magnet” programs that could be spread out to many other schools, creating the seats we need. Creating high-performing programs within schools, even at the expense of whole-school magnets, which I realize would be unpopular, would allow kids to move in and out of classes as their desires and abilities dictate – not as their parents’ resources allow. We should not require such deep parental involvement to get kids on a college-bound track. One of the board members hit it straight on in a recent meeting- the system favors families with the bandwidth to navigate the bureaucracy. Ideally, every school in every resides area could accommodate students of all levels. Advanced students should be challenged. High-risk students should be given the support they need. All students should be able to be doing work that is rewarding and challenging and not have to move buildings to do it. In my case, and in that of many others, I will put my child in private school before I send him to his resides school. There is just nothing for him there. I am saddened to say that, since it’s the same school I graduated from. But it is a fact that if he is not admitted to a magnet program for high school, I will either have to move or send him to private school. JCPS is being diluted by its own policies. The number of people who move to private school or to Oldham County because of the sibling and school choice policies amazes me, as I’m sure it does you. We can’t get those people back once we lose them, and next year, we might lose one more – mine. Steph Horne then asked me to define in writing what a successful magnet program within a school would look like. Whole-school magnets require kids to move buildings to get in, which requires parental involvement, and it discourages kids from taking a risk and attempting more challenging work because if they do not succeed, they have to move buildings again. Because the magnet requires an application and minimum performance to stay in it, there is a level of commitment that may not be present elsewhere. Children whose parents did not explore school choice have opportunities to take on more challenging work, whether or not their parents took initiative to make that happen. When you put high-achieving magnet programs in high-poverty areas, school activities that might not otherwise not exist are funded by the higher-income parents who send their kids there. Putting magnets in areas where the population is not diverse can cause the school to improve its diversity voluntarily. This is an important point that the MSA really missed. We have diversity issues in housing and education. Magnets within schools moves money, and it causes people to become accustomed to seeing people who are racially or culturally different from themselves. So with all that said, I do not know why every parent chooses the magnets that they do, but I would bet that the majority choose a magnet not because of a focus on an area of study but rather for the environment and core content areas. My child will be learning alongside children who are equally capable and committed to success in school, and whose parents or other adults are supporting them along the way. Student applications to get in, and exiting to less challenging classes when needed would have to be part of the program. There will be extracurricular activities and elective classes that will allow my child to explore his interests, and to keep him doing something that makes him happy even if the rest of school does not. My child will have the opportunity to explore and develop talents in music, art, theater, and competitive sports. The learning environment will be safe and free from distraction. The administration will be willing and capable of helping my kid pursue the next level of his education, including guidance for middle /high school /college admissions and scholarship guidance. There will be enough children like him in his classes (20% seems reasonable) so that he does not feel isolated from the rest of the school and he has opportunities to find and develop a few close friends out of a relatively large cohort. There will be enough diversity among racial and ethnic groups that he sees in school what educated adults see in the world. For me right now that is the MST program at Meyzeek. But I would not have cared what the program was actually called. My kid is not even taking any science electives, he is taking Band and French, which was a big reason he chose Meyzeek- it has a full-year foreign language program that Noe does not. The MST made no difference whatsoever – it was the above things I was after. Meyzeek has a large resides area with a dramatic poverty rate and they make it work, for everybody. If you could make a truly high-achieving, college-bound core content magnet combined with specialized electives, you’d really have something. What about calling Noe the Art Achievement program(because you have more art class choices there) , Meyzeek the science achievement program (because you have to do science fair), make another school have 3 different kinds of specialized PE electives – call it the active lifestyle magnet, another one have more computer electives. All resides schools, all magnets within that school, but all of them also offering college-bound, high-achieving core content with the requirement to apply and perform to get in and stay in. Then you’d give every kid who wanted to try a chance to do it without concentrating every high-achieving kid in the district into a handful of schools. Over time I’d bet the number of schools WITH performance magnets, if they were done right, would outweigh the number of schools without them. There are so many issues to consider, and this district is so big – I am amazed that a single group of people is expected to oversee every aspect – from bus engines to nutrition to college preparation. I know it is too much. But I think that so many people exit JCPS or never enter — people with resources and time — that if we could mitigate their reasons for leaving we might end up with more resources for all the kids, available closer and closer to home. I wanted to start by saying thank you for being my first teaching position and starting my career five years ago. Over my five years of teaching in the district I have had the opportunity to work with some phenomenal teachers, students, and parents. I was fortunate to call XXXXXX High School my home for the last five years. Daily I worked with students and teachers that worked under adverse conditions to earn their education. Teachers that worked long hours, students that often stayed after school, and a building that worked to create a caring environment for our students. We have some of the hardest working teachers in the district. I was fortunate to work under XXXXXXX during my time at XXXXXX and work with some exceptional teachers and mentors. I would more than likely still be at XXXXXXX and a resident of Louisville, but over the last two years the education and work environment of JCPS has left me drained and empty. It was not the students or hard work that left me empty, but the policies and decisions being made that affected my job every day. We have implemented poorly developed strategies and processes because they touch on the buzz words for good education. Many of the students in our district are working hard to earn their high school diploma, but we have many students that see through the facade for what JCPS really is doing. We implemented Standards Based grading with no plan because this was going to make students work harder. In reality it was your teachers that worked harder to provide multiple attempts for students that knew that they could no longer fail your course. We implemented PBIS without training the teachers or staff thoroughly because the suspension rate needed to change. As a result of this poorly implemented program the students have gained control in many of your schools and classrooms. As a result a few students affect the education of the entire population because there are no longer consequences for their actions. We continue to test students with CASCADE, when the assessments are not being given with fidelity or are in the best interest of the students. In addition to poorly planned processes, the district has consolidated and promoted administrators and support staff that put their own best interests in front of the students. Several programs designed to help the students at XXXXXX High School have been indefinitely placed on hold or scrapped completely because of poor district leadership. We have had to jump through hoops to implement research based reading intervention programs during which time it is the students that suffer. We have had to cancel the development of satellite computer centers for our kids, when the computers have already been donated. At the end of five years with JCPS, I made the decision to leave my home. I left because I could no longer go into this job every day because I felt that we were no longer providing an effective education for our students. I still love teaching and I have sent this letter and continue to support the teachers at XXXXXX High School and their initiatives from the other side of the world. I implore the district to change the direction in which it is heading. The students cannot be helped by poorly implemented decisions and keeping the public in the dark. We need as educators the support of the parents and our communities. We need administrators that are invested in the success of each school. We need to work together to look at the students and data available and make educated decisions with the teachers, parents, and community members working together.